Precision Quilting Tools Self Healing Cutting Mat 24"x 36"- Durable self-healing 5-layer construction. Reversible design with dark background on one side and light background on the other. Easy to use layout with two sets of numbers for reading left to right or right to left. Accurate 1" grid with 1/8" marks for precise alignment. 30, 45, 60, and 90 degree guide lines. 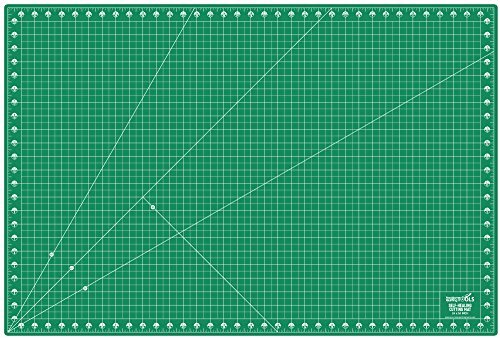 Precision Quilting Tools Self Healing Cutting Mat 24"x 36"
Precision Quilting Tools Self Healing Cutting Mat 24"x 36"- Durable self-healing 5-layer construction. Reversible design with dark background on one side and light background on the other. Easy to use layout with two sets of numbers for reading left to right or right to left. If you have any questions about this product by Precision Quilting Tools, contact us by completing and submitting the form below. If you are looking for a specif part number, please include it with your message.